Jean Maran Wheeler and Benjamin Franklin Wheeler, Jr. 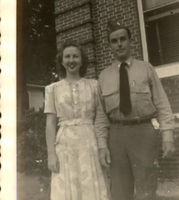 Wife and husband, Jean Maran Wheeler (1921-2001) and Benjamin Franklin Wheeler, Jr. (1920-2006) around 1943. Wheeler was the son of prominent citrus grower, celery cultivator, and politician Benjamin Franklin Wheeler, Sr. (1878-1954) and George Lee Wheeler. This photographer was taken at the home of Wheeler's father located at 340 South Lake Jessup Avenue in Oviedo, Florida. Wheeler graduated from Oviedo High School in 1938 and went on to attend Stetson University in DeLand until he was commissioned as an officer in the Navy during World War II. After the war, he returned to Stetson and earned his business degree in 1945 and later his honorary law degree. Wheeler took over the family businesses, Wheeler Fertilizer Company and Nelson and Company, in 1954, when his father passed away. Nelson & Co. grew citrus and cultivated celery in Oviedo, Florida. Wheeler's wife, Jean, died in September of 2001 and Wheeler himself died on November 30, 2006. Original 2 x 3 inch black and white photographic print: Private Collection of Vicki Clonts. Digital reproduction of original 2 x 3 inch black and white photographic print. Wersinger, Tammie. "A man of his word, Frank Wheeler was head of Oviedo family dynasty." The Orlando Sentinel, October 3, 2006. http://articles.orlandosentinel.com/2006-10-03/news/DEAD03_1_frank-wheeler-ben-wheeler-oviedo. "Jean Moran Wheeler." Legacy.com. hhttp://www.legacy.com/obituaries/orlandosentinel/obituary.aspx?n=jean-moran-wheeler&pid=92336. “Jean Maran Wheeler and Benjamin Franklin Wheeler, Jr..” RICHES of Central Florida accessed April 21, 2019, https://richesmi.cah.ucf.edu/omeka/items/show/6283.